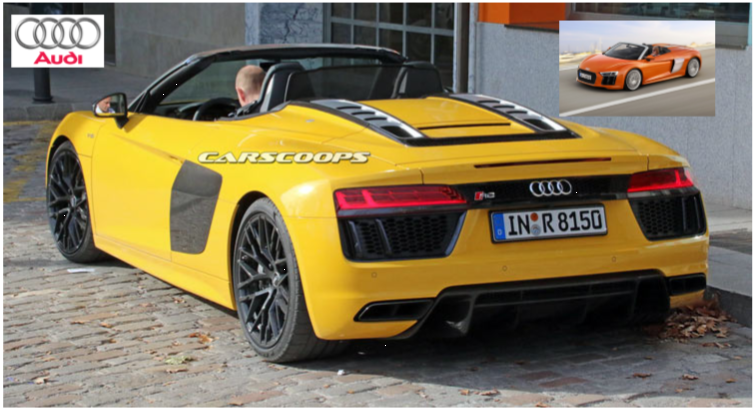 No need to wait for an official release on Audi's next generation R8 Spyder as seen totally undisguised out on the streets of Germany. Just like the previous R8 Spyder, the new model employs a good old-fashioned canvas roof that neatly tucks away behind the passenger compartment and under a retractable panel above the engine, which itself, has a very similar design to the outgoing model with twin vented buttresses on either side. Audi also transferred the engine vent from the top of the trunk lid on the coupe to in-between the tail lights on the Spyder, but the rest of the car, including the interior, remains unchanged. The new R8 coupe lost 66kg (145 pounds) over the older car, so we expect similar savings on the Spyder. The gloss black exterior trimmings, including the side blades and exhausts, along with the additional buttons on the steering wheel inside, confirm that this model is the 'Plus', which is powered by a 610PS (602hp) and 560Nm (413lb.ft) version of the 5.2-liter V10 mill. There will also be a base R8 Spyder V10 fitted with the same engine de-tuned to 540PS (533hp) and 540 Nm (398.3 lb-ft) of torque, with both V10s to be combined exclusively to a 7-speed S-Tronic dual-clutch transmission driving all-four wheels. Many reports have also emerged on the development of an entry-level version for the R8 series fitted with a twin-turbocharged V6 engine instead of a larger V8, mainly to satisfy demand for smaller displacement engines in China, and which should be offered in the Spyder as well. We could see the new model making its world premiere as early as this month at the New York Auto Show.